Birmingham City's experienced defender Jonathan Spector has agreed a new two-year contract. The Championship side have also signed up 20-year-old reserve keeper Nick Townsend on a two-year deal, with the option of an extra year. 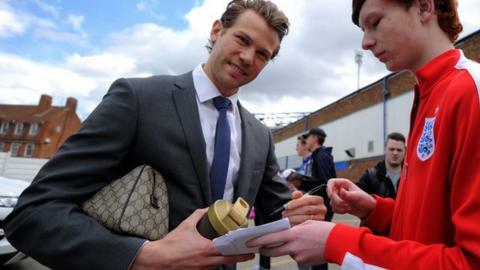 Spector, 29, has made 127 appearances since arriving from West Ham in August 2011, but his part in Blues' 10th-placed finish was injury-disrupted. Townsend is set to start next season as Blues' reserve goalkeeper. It follows the decision to offload long-serving keeper Colin Doyle. Townsend has yet to make his Blues debut, but he did spent the first three months of last season on loan at Conference side Lincoln City, making 17 appearances, having also spent three months on loan with the Imps at the end of the previous campaign. City have still not given up on persuading current first-choice keeper, Republic of Ireland international Darren Randolph, to stay at St Andrew's.